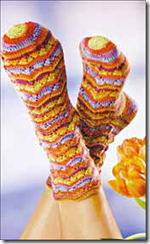 Bookish Thursday: The Sock Knitter’s Workshop! So, I the not-a-sock-knitter am planning to start a pair of socks just for knitting while in lines at Disney. 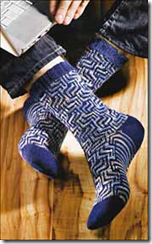 I love knitting socks in line, it just looks so cool and people are always intrigued. Also they are a nice small project that is portable. When todayâ€™s book was offered to me I thought ok, Iâ€™ll take a look.. well.. I did and I am in LOVE!!!! 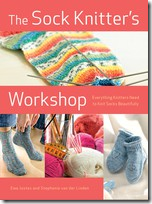 The Sock Knitter’s Workshop by Ewa Jostes and Stephanie van der Linden is terrific! 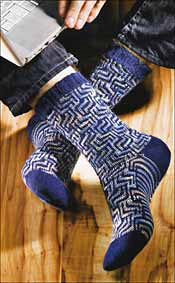 Itâ€™s like a buffet of techniques that you can mix and match to make socks!!! Anyone who knows me as a knitter, knows I love interesting construction in knitting. So this book is right up my ally! There are like 13 different heels, 7 different toes, 5 cast on methods, toe up cuff down if it is a sock knitting technique that has been inventedâ€¦ itâ€™s in here! Of course there are also some really nice patterns..
oooh those are crazy fun looking.. So many sock options so little time. hehe or well in my case I might have time in those lines! !